The Canyon Motel near Pine Creek Gorge offers clean spacious rooms, comfortable beds and well-kept furnishings. End your day with a peaceful doze in our Adirondack chairs just outside your door. We welcome both business and leisure travelers alike with a diverse collection of room accommodations only two blocks from Main Street—you barely have to roll out of bed to enjoy the historic attractions of picturesque downtown Wellsboro. Need some additional relaxation inspiration? Soothe your cares away with our indoor heated pool and hot tub. Our 44-room motel features exterior and interior corridor rooms, mostly on one floor. Double, Queen, and King Rooms have all the modern conveniences: coffee makers, hairdryers, microwaves, mini refrigerators, free Internet access, and cable TV. Some of our king rooms also feature a 2-person Jacuzzi tub. 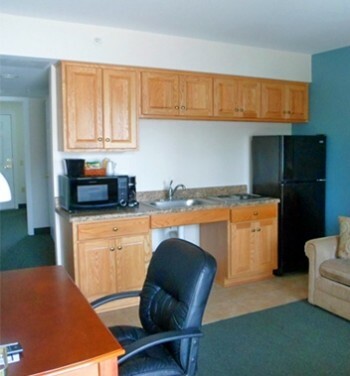 Large and roomy Suites have either 2 or 3 beds, plus a relaxing sitting room and a small kitchenette. Apartment-style accommodations at the Canyon Motel feature a full kitchenette, fireplace and Queen sofa. For families or groups looking for short or long-term reservations with even more of the conveniences of home, Canyon Motel provides the only Extended Stay motel in Wellsboro. Our Extended Stay suites offer either 1 King or 2 Double beds and include a full size refrigerator, 2-burner stovetop, pullout Queen sofa bed, and outdoor lawn area with seating. Our extended stay motel in Wellsboro is a home away from home for travelers looking for long-term stays. Our staff is always available to assist with any special needs.